Recent research on vitamin D adds weight to the argument that we should all watch our vitamin D intake. As many as 60 percent of the UK population is vitamin D deficient and low levels have been linked to serious health problems in later life. That's where a vitamin D nutritional supplement can help. 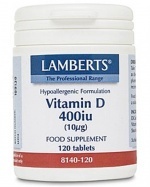 Each tablet of Lamberts® Vitamin D provides 400iu (in the vitamin D3 form), which is twice the RDA and the level often recommended. This form of vitamin D is suitable for vegetarians.